The proposed new marijuana-growing farm and manufacturing operation in South Buffalo took its first baby steps toward city approval Monday – even as company executives still await the State Legislature's action to legalize recreational use of pot across New York. Flora-California Prime and developer Zephyr Partners are seeking to construct what they call a high-tech cannabis campus at Buffalo Lakeside Commerce Park, in a $200 million private-sector bet that demand for marijuana-based products will boom as soon as it's legal in the state. The company, based in Solana Beach, has signed a contract with the Buffalo Urban Development Corp. to acquire 72.4 acres of vacant land in the business park – of which 47.6 acres are usable – with plans to complete the $1.9 million purchase by early in the second quarter. Executives hope to be able to start construction by the end of this year or early 2020, with a goal of getting the facility up and running by August 2021, if not sooner. Much of that is still contingent on getting Albany to sign off on legalization. Gov. Andrew M. Cuomo expressed his support, as have legislative leaders, but the language was taken out of Cuomo's budget this month, so lawmakers could hash out details amid disagreements over specific elements. Flora officials Monday voiced confidence. "That is part of the process, a healthy debate over the legislation," said Ryan Herrell, senior vice president of development for Zephyr. Zephyr's founder and chief executive officer, Brad Termini, is one of the founders and leaders of Flora. "Both the legislature and the governor are committed to passing legalization this year and we have a lot of work to do to get a project like this ready to go, and this is part of the process that we’re going through," Herrell said. "I see the parallel paths as flowing together." As part of its efforts to gain public support, Flora Buffalo will host a second community forum Tuesday from 6 p.m. to 8 p.m. at Southside Elementary School at 430 Southside Parkway in Buffalo. The program will feature South District Councilmember Christopher Scanlon, new Flora Buffalo chief executive officer Dasheeda Dawson and Erie Community College Provost Douglas Scheidt. 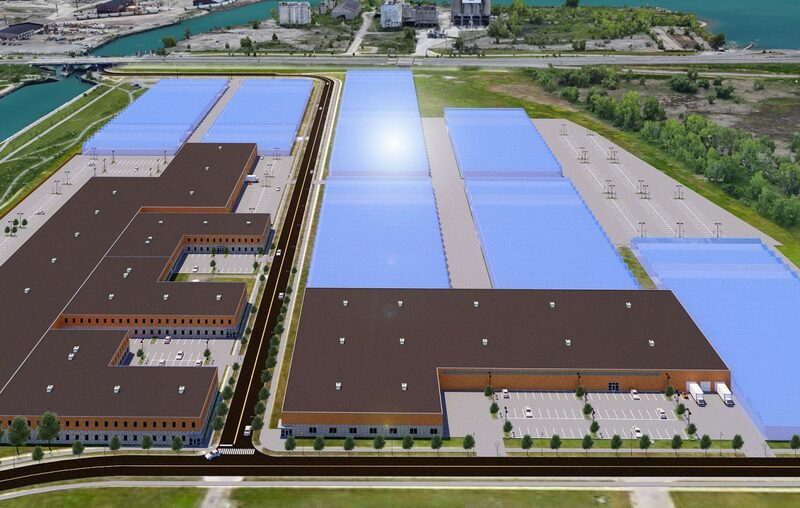 Plans for Buffalo call for an overall campus of 1.375 million square feet of building space, including 850,000 square feet reserved for the "grow facility," which will consist of greenhouse buildings. The complex will also include manufacturing facilities to produce a wide range of products, from oils, lotions, balms and creams to pills, food, beverages and traditional joints. That's more than three times the size of Flora's operation in California, where the company is just now putting plants into its new 250,000-square-foot grow facility, although it already has some smaller cultivation and dispensary operations in that state. The rest of the Buffalo facility will include space for support and headquarters functions for the Buffalo subsidiary, an educational program with ECC, medical research with Roswell Park Comprehensive Cancer Center and a business incubator for new cannabis-related businesses. The project is expected to employ 500 to 1,000 workers in lab technician, research, cultivation and manufacturing jobs, among others, with ECC providing on-site training both for Flora employees as well as for new businesses in marketing, banking and other industries that will crop up to support it, Herrell said. "There are so many businesses surrounding cannabis that will need to be filled in," he said. In the meantime, the company submitted its first plans with the city, including an initial environmental and coastal assessments as required under state law. Specifically, the project will feature about a dozen buildings, including seven "growing facilities" of various sizes, two "post-harvest" buildings, an incubator building and a building for office, research and labs. The buildings are mostly one-story in height, except for the office and incubator buildings. The growing facilities include three buildings of 94,080 square feet each, and four others ranging from 90,000 to 168,500 square feet in size. As part of the review, the company is also asking the Common Council to amend the zoning on the four southern parcels it is acquiring along Laborers Way, so all eight properties can be developed as one. The Buffalo Planning Board on Monday recommended approval of the request, and accepted the coastal consistency determination. The Council's Legislation Committee will consider the requests on Tuesday, followed by the Council itself. Once approved, the full site plan will come back to the Planning Board for approval.